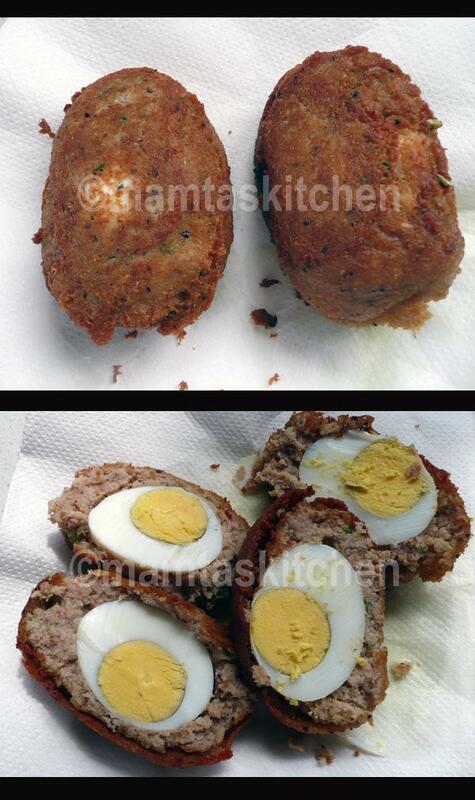 This recipe is based on Gill Cox's recipe; Fish Scotch Egg 1, with Curried Mango and Lime Mayonnaise. It is easy to make and is suitable for people who do not eat meat, but eat eggs and fish.You will note that egg yellow is well cooked here. It is because most people in India do not like runny eggs. If you like, you can use half boiled eggs. Makes 4. Boil eggs for 10 minutes and cool under running water. Keep aside. Place everything else in a food processor and blitz. If you do not have a food processor, you can mash everything well by hand too, and make a dough like consistency. Divide fish mix into 4 and make balls. Spread each portion into a 1 cm. thick oblong. Put one egg in the centre of each, and mould the fish mix around each egg to enclose the egg completely in it. Deep fry gently to golden colour or bake in hot oven. Serve hot or cold, with chutney or sauce of choice.